Lippy in London : I love mine, do you love yours? I love mine, do you love yours? You may have heard of this brand before but I'm going to have a bit of a rave about it because I think it's both hysterical and a brilliant idea. Introducing I Love My Muff. What is I Love My Muff??? I tip my hat to I Love My Muff founder Ritz Clinging (awesome name! ), a woman who wanted something, couldn't find it, so made it herself - the I Love My Muff range. Ritz saw a gap in the market for unashamedly proud feminine hygiene products and created a range of intimate washes, wipes, sprays and lotions for savvy women who think their bits deserve a little tlc! The packets of gentle, moisturising paraben free wipes come in a pack of 25. To be honest, I was expecting these to smell a bit 'medical' but they actually smell really nice and fresh thanks to extracts of cucumber, chamomile flower, vitamin E and lavender. I think the wipes, and the whole range are fantastic. I love the concept, I love the packaging and I adore the brand's mantra : It's no longer a whisper, it's a statement. I love my muff. Providing daily love and care for down there. So I'm jumping on the bandwagon and I'm going to say it. Now the question is, do you? 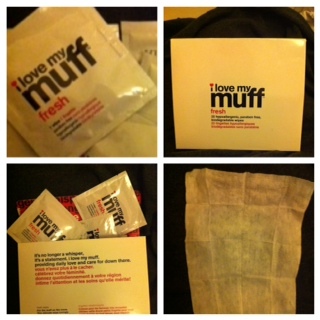 Visit I Love My Muff to discover the range that retails from £18.